Sema Studio apartments are located in Kyrenia town and each vary in size/dimensions and internal layouts. They are of a clean modern design and are furnished to a good standard without a hefty price tag. Within easy reach and walking distance to Kyrenia town with its beautiful horseshoe harbour, fine dinning and great nightlife. You are also very near some of the best beaches that Kyrenia has to offer, Ice Beach, Deniz Kizi, Kervan Saray to name but a few and also great views. Super markets for daily needs located along the main road and easy to get to. Car not essential, but if you wish to explore Northern Cyprus and travel further afield, then we recommend that one is hired. Off Road parking available in front of building. Bookings of three adults or less are allocated in 1 studio with 1 adult sleeping in fold out bed. Bookings for a group of 5 adults guests will be allocated 2 studio's with 3 sleeping in 1 studio and 2 sleeping in another studio. For a group of 6 adults guests will be allocate 3 studio apartments. For a group of 8 adults will we allocate 4 studio's. Young children must sleep in the same studio as their parents. More studios coming soon and we can then accommodate 12 guests in 6 studio apartments. Each studio is fitted with its own electricity and water meters and we charge £20 per studio for electricity and water for each studio required during the booking process. Once used, addition units can be purchased if needed during your stay, full details will be given before your arrival on how to purchase your top up units. Prices are on a per guest per night basis. CCTV 24/7 in communal areas. Studio's allocated subject to availability. Self Checking with Keysafe Code. We are a Turkish Cypriot family of three who love to visit Cyprus when we can. The Architect who built this property is a relative of ours and he informed us that this land was available, so we jumpted at the chance to invest in this location as it has everything one could possibly wish for on our doorstep. within walking distance to Kyrenia Harbour and also shops, bars, cafes and the beaches are within easy reach by car. Studio 1 Bathroom room contains up and over shower wash basin and WC. 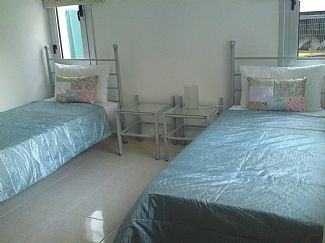 extra bed linens provided for guests who stay more than 10 nights. We provide bath and face towels. Beach towels are also provided 1 per person. Open plan lounge, dinning area and kitchenette area. Kitchenette area is well equipted for a holiday let. Each studio has a seating area for 2 guests. Baby highchair can be provided on request during the booking process. Boat trips can be booked along the Old Harbour in Kyrenia Town which are a great way to explore the coast. Sking is on the Troodos Mountains in South Cyprus, about 2 hours away. Golf can be played at the Korineum Golf & Country Club. Suitabul for large groups of friends, or families wishing to stay within close proximity to each other, but with their own living space. Marisa, the owner, very kindly let me stay in her beautiful penthouse which is in the same building as this apartment. Both properties have absolutely everything you need, the location is great for both Kyrenia town and harbour and the local beaches. Nothing is too much trouble for the owner and this is the 4th time I've stayed in her properties. If you are looking for a bigger property take a look at Sema villa - absolutely stunning, fantastic location and with beautiful pool and outside space. I would have no hesitation in recommending any of these properties. Thank you for a lovely review. We are happy that you enjoyed your stay in our home and look forward to welcoming you back again in the near future. Ercan Airport is reached via Turkey or you can fly into the south of the island, Larnaca airport and cross via the border. Transfers cost start from around £55 (correct at the time of going to advert, so please check at time of your booking ), and the cost can vary depending on your arrival airport. Kyrenia is within walking distance where you will be spoilt for choice as to where to eat and drink during your stay. Booking Notes: Minimum stay for 7 nights. Only guests who are book are allowed to stay. CHECK IN TIME: 16.00pm CHECK OUT TIME: 11.00am Late check out charges apply if you fail to leave by 11.00am. Please check before arrival. Changeover Day: Flexible changeover days. Notes on prices: Prices above are for 1 guest staying. Additional guests will be charged £10 per guest per night. Please use the calculation button to calculate yours required dates and prices for your group size. Electricity allowance is 100TL per booking added to your meter for the first studio only. If additional studio's are required then additional units of electricity and water for each studio will need to be paid for before arrival. This cost will be added to your booking contract during the booking process. Owner reserves the right to make changes and amendments to all the details, including pictures and prices without prior notice. We are constantly making improvements and furniture changes might be made before your arrival and could be different than the pictures on the website during your visit. Nevertheless they will always be of a high standard with you in mind. This property is CCTV monitored in communal and outside areas.